Samuel Otazi a resident of Bayelsa State gave his children an insecticide to kill them. 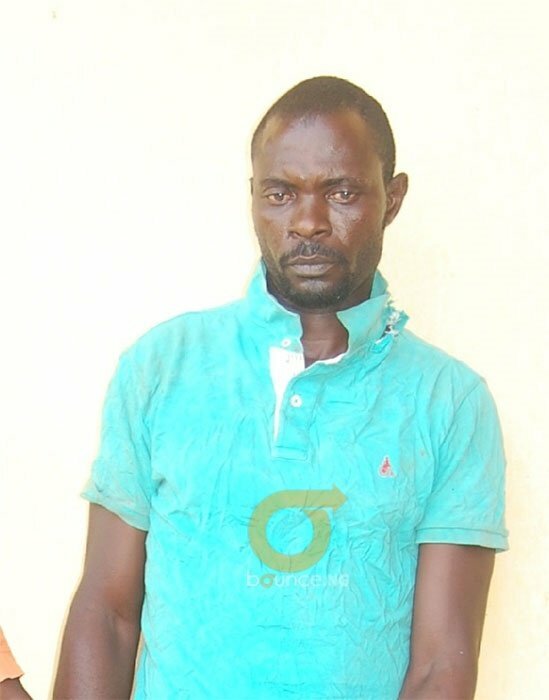 A man Samuel Otazi decided to kill his children with poison after he got a prophecy in church, days before the end of 2018, that they were the reasons he has continued to suffer. In the time of Jesus Christ, who laid the foundation for Christianity and the church, there was no record of a prophecy from him that forced a believer of what he taught to kill his own children. Many will say it is only a mad man that will kill his children over a prophecy and his failure to make something out of life, but a father decided to end year 2018, sacrificing his children on the altar of prophetic utterance. The story is so weird that even the police are shocked. Why would Mr Samuel Otazi decide to poison his children with an insecticide just because he received a prophecy? Bounce News followed up on the issue and heard a different story that will make you take a second look at the man who is now in police's custody. "In all my years as a police officer, l have never heard anything like this," police spokesman in Bayelsa, Asinim Butswat, told Bounce News, as he explained police's findings. Mr Samuel Otazi was a native of Agobiri community in Zarama under Yenagoa Local Government Area and was into oil bunkering until things fell apart. His business crumbled, the mother of his children left and his mother took custody of his three sons. Tough times continued for him until he got a prophecy in December 2018 that changed everything for him. A member of the church, with George Odogu as prophet, who asked not to be named told Bounce News that the prophet made a pronouncement in his church that there was a man among the congregation whose children had been bewitched by their mother. He advised the man to put an end to the trend, as they contributed to his hardship. According to the police's investigation report, on new Year Eve, Samuel accompanied by his brother, convinced his mother to allow his sons aged 10, 12 and 14 to worship at his church and thereafter, spend the new year day with them. They boarded a bus, but that journey did not end in the church. They stopped along a bush path and he led his sons into the bush and stripped them naked. With the help of his brother, he bounded their hands and feet with ropes, tied them to a tree and forced a liquid which was identified as an insecticide down their throat. He had planned to kill his sons as a result of the pronouncement made by prophet George Odom. Certain that he had solved his problems, he went home satisfied, but while his two younger sons died immediately, the eldest survived. The police spokesman confirmed the incident and said: "The man is in our custody now and will be charged with culpable homicide. "lt broke my heart when l saw lifeless bodies of promising children murdered by their own father. "His accomplice, who helped him tie the boys is on the run. We have also extended an invitation to the prophet," he said. A member of the church, Mrs Margaret Tonye, who also spoke to Bounce News on the issue insisted that no name was mentioned when the prophecy came. "The prophet only talked about a man whose sons were wizards. "He said the person should do away with the children before they ruin his life," she said. How Mr Otazi understood the word 'do away', is something that could have resulted in the killing. Snapping his fingers, another member of the church, Mr Kennedy Egberi, also stated that the prophecy was never directed at anyone. "We attended the church together the day of the prophecy. "It's only a mad man that will kill his children over a useless prophecy," he said. Mr Otazi has, however, confessed that he acted based on the prophecy, but highlighted that it was not directed at him. He acted based on the setback he experienced in his bunkering business, and claimed that he was always sick and that things never went well for him. According to him, he saw the mother of his children as the reason for his problems and had consistently called her a witch and felt she transferred it to his sons. At home, his aged mother wept uncontrollably, knowing she had lost the children she had been nurturing. "I have not only lost two grand-sons but also my son," she said, knowing that Mr Otazi will face homicide charges. The surviving son is recuperating in an undisclosed hospital while the corpse of his two brothers have been deposited at a mortuary.